Prizes will be given away to mark LoadCentral’s 10th year in the business. For the next 10 (ten) months, lucky retailers will be rewarded with Free LoadCentral Wallet. Below is the Promo Mechanics for your reference. Promo period is from February 16, 2015 to December 15, 2015. Promo is valid for ALL LoadCentral individual and independent i-cafe retailers. Each winning retailer account from our Monthly Draw will have a chance to double their prizes. If the total Smart () sales of winning retailer is at least 50% of its total LoadCentral sales, its LoadCentral wallet prize will be doubled. Example: Tier 1 winner sold Php15,000 and Smart sales is Php7,000. Its Php5,000 prize will be double to Php10,000 LoadCentral Wallet. To qualify for the GRAND DRAW, individual and independent i-cafe retailers must have at least Php5,500 sales for the entire duration of the promo of from Feb 16 2015 00:00:00 until Dec 15 2015 23:59:59. 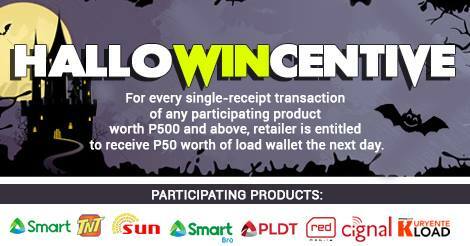 From the qualified individual and independent i-cafe retailers, 5 winners will be randomly picked and will receive Php5,000 worth of LoadCentral Wallet. LoadCentral wallet will be automatically loaded to all winners after each draw. LoadCentral will send a SMS to notify the winners. The list of winners will be announced on LoadCentral’s official fan page and website. In the event that the winner did not receive the prize, he/she may contact LoadCentral office at (02) 441-5171. Promo is open to ALL frontliners/cashiers of all LoadCentral corporate accounts which are using the LoadCentral webtool/CWT/SMS facility in retailing. LoadCentral will inform the head office for the winning retailers. Prizes will be delivered to each of the winning corporate account’s head office.